Father John Katamba was born, May 4, 1957, to Athanasuis SSerunjogi and Lovita Namukwaya in the Central region of Unganda. He attended St. James Bbiina and St. Joseph Primary school Nabbingo and St. Peters Secondary School. 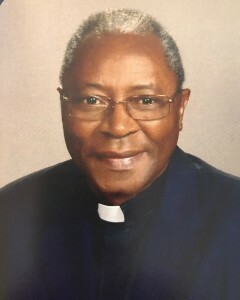 He conducted Catechetical programs at GGaba Pastoral Institute and began at Mbaaga's Seminary in 1977. Father was ordained a priest on December 16, 1984, by Emmanuel Cardinal Nsubuga, the Archbishop of Kampala Archdiocese. He first served as the Associate Pastor (1984-1985) and then was appointed Pastor of Sacred Heart Parish (1985-1991). Father John was Father in Charge of the Catholic School (1991-2007) and Director of Catechesis and Catechists in the Diocese. He served as Director of John Paul II Pastoral Centre beginning in 2007. On December 11, 2011, he was appointed Parish Administrator of St. Joseph and Immaculate Conception Parish in Oneida, Wisconsin.